This is part two. If you haven’t read part one, check it out now. So let’s continue our discussion about resources and resource management. In the first part, I talked about different types of resources—primarily physical vs invisible resources—and how to recognize them, and how different types of players will recognize them and value them differently. Today we’re going to expand on that knowledge and go deeper into the implementation and balancing of those resources. Resources in games is all about conversion. The transformation of one resource into power, or in order to advance through the game. Like collecting keys to open up doorways. Or one type of resource into another, like selling off items for gold, which you can use to buy different items. I can’t resist a chance for a Pokémon screenshot. There are two problems with the idea of resource conversion in games. The first problem is simple: it’s usually boring. Converting things is something that happens in science or math class in middle school. In order for it to be fun, the player needs to get something out of it. Making it fun comes down to the design of the resources and the gameplay around them. More on this later. 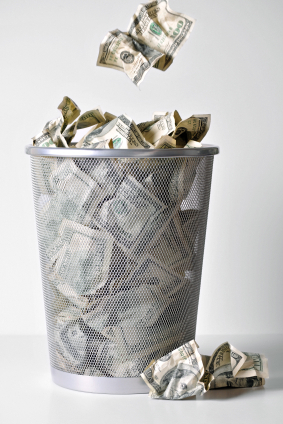 The other problem with conversion is in the balance of the costs. For the entire process to work, the player has to be willing to make the trade. The player needs to be getting a fair price—maybe even more than fair. Let’s look at this in terms of each of the types of resources discussed in the last article. In terms of physical resources—let’s use a simple example from RPGs: gold. Over the course of the game, the player typically finds a lot of gold. Not only as battle rewards, but in chests, or from selling excess items. It’s not atypical for a player to accumulate more gold than he needs. Now, by the end of the game, I would say that this a good thing: the player feels accomplished—he feels infinitely wealthy, and that money is no object. At this stage in the game, money is a useless reward; if a player goes out of his way in the final dungeon for a chest that has a hundred gold in it, he feels cheated. But the main point I want to make comes much earlier in the game. For the majority of the game, it’s not a good idea to give the player too much gold. If he has enough money to buy the best armor upgrades whenever he wants, and stock up on limitless potions, then money is meaningless. It’s a good feeling for the player to have in the endgame, but in the early and middle parts of the game, all it does is lessen the challenge. The real value of gold as a resource is that the player needs to manage it. If he has enough gold to buy everything he wants and more, then it’s a useless resource. All it does is waste his time when he goes to shops. However, if he has just enough to buy one or two pieces of equipment, but not enough for his entire party—he needs to think about how he’s going to plan for the next section of the game. He might always be able to grind for more gold, and in that case gold has a real value—he’s going to have to trade his time to get more of it. If he’s willing to make that trade, then he deserves to be able to buy the best equipment for his whole team. Giving the player that option is always a good idea, because it gives him the chance to get as much as he wants—or as little—out of the resource. This is where it falls on the developer to carefully balance the cost of items in the game, and the amount of currency that the player has access to. Too much gold, with items that are inexpensive, and the game loses a significant amount of challenge. Too little gold, with items that require a lot of it, and the player will feel like he’s doing something wrong. Take the time, when playtesting your game, to note how much gold you have when you reach different areas. Make multiple playthroughs—sometimes intentionally skipping a chest of gold that some players might not find, and sometimes doing some extra grinding. Find an average. Gold, as a resource, is completely useless to the player if there isn’t a good balance between cost and benefit. In this case, the cost isn’t the gold itself—it is what the player does to acquire the gold. The benefit is whatever the player spends the gold on. A player should be able to find a certain amount of gold “naturally”. In return for this amount, he gets the “expected” equipment and items when he reaches the next town. If the player has more gold, however, then he has the option of spending it in a way that gives him advantages going forward. Gold’s an easy example, and probably one that you’ve thought about before. What about less obvious resources? I briefly mentioned “pool” resources when talking about physical resources. Unlike the kind of resource that you acquire and sell/convert, it’s a resource that you have which you use up. The easy example of a pool resource is MP (SP/FP/whatever) in RPGs. Each character has a pool of magic that they use in order to cast their spells. It works a little differently than gold or items, but keeping it balanced has the same idea: cost vs benefit. 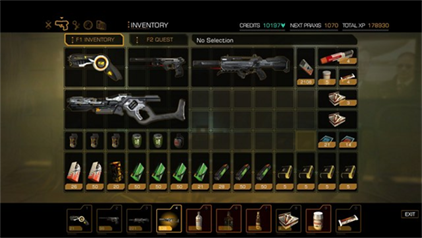 Let’s look at the inventory system in Deus Ex: Human Revolution. It’s a pool resource because you have a specific amount of inventory slots that you use. The more items you are carrying, the less open slots you have available. At some point in the game, you’re going to need to throw away some items. Deus Ex: Human Revolution’s inventory screen. The more powerful items take up more space, so you can’t have all the best weapons at once. It’s particularly interesting because, as your character levels up, you have the opportunity to expand the size of the inventory. At the beginning of the game, you have few inventory spaces, and it fills up quickly. When I play the game, expanding my inventory is my first priority when I level up. But that is optional: the player can instead upgrade something else when he levels up: maybe he wants increased health, or the ability to fall from heights without taking damage, or maybe he wants a cool cloaking ability (sure, in DXHR, levels are plentiful enough to unlock all of these things before the end of the game). If you decide to spend your levels to access more inventory slots, you can carry more items (duh). It works well because, as you progress further into the game, you come across more items, and items that are heavier (they take up more space). Again, it’s a trade-off. The more powerful, cooler items require more inventory space than the smaller stuff, like handguns or medicine. If you want to hold all those sweet guns, you’re going to need to invest some levels into inventory expansion. But even then, you can’t carry everything. And while I normally hate inventory limitations in games, it really serves a purpose in DXHR and actually makes the gameplay deeper. The reason for this is because your weapons and ammunition take up inventory space. You can’t carry every heavy weapon in the game—you simply don’t have enough room. You have to make a choice: do you really need that badass plasma rifle, if you have to leave behind the crossbow that you rely on for stealthy kills? Or, if you really want both, maybe you can drop the trusty sidearm and some medicine. Who needs that stuff when you have firepower, am I right? Because one of the main selling points of the game is the way it allows—and even encourages—a variety of play styles, this type of decision-making enhances the gameplay. It’s done by forcing the player to really think about how he uses the resources he has available to him. If DXHR had the same inventory management system, but didn’t include weapons and ammunition on the screen—forcing the player to spend time managing his medicine, powerups, and grenades, the system would have been horribly tedious and would have detracted from the gameplay. Instead, it compliments and enhances the gameplay by furthering the game’s themes of choice. Like I said in the last article, the best example of an invisible resource is time, and in RPGs, that time usually amounts to turns. I’ve talked about this in multiple articles before. Call me lazy if you want, but I like to think that I’m managing my own resource of time. Here is the article where I go in-depth on the subject of the value of a turn: Read the section on status effects. At the beginning of this article, I said that one of the biggest problems with resource conversion is that it’s difficult to make it fun. But this is a bigger subject than this article has space for. Looks like this one’s going to end up being a three-parter, after all. See you next time, when we bring it all together and make resource management fun for the player.